As part of its never ending mission to stop the evil Cobra organization, the G.I. Joe team has created Spy Troops, an elite force of G.I. Joe members disguised as the enemy. Buy 1 for $12.36Buy 2 / Save $0.66!Buy 3 / Save $2.47! Size (inches): 2.36" X 2.76" X 3.15"
Unleash the fury of Sound Attack! With each weapon, activate a different sound - 16 in all! Additional Sound Attack weapons available in G.I. Joe figure packs and vehicles. (Vehicles are sold separately. Vehicle purchase is required to activate Sound Attack). Duke, the G.I. Joe team's brave and fearless leader, confronts the malicious and hate-filled Dreadnok Ripper! 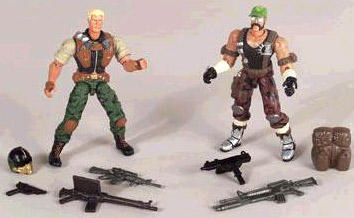 Set includes guns and Sound Attack weapons.